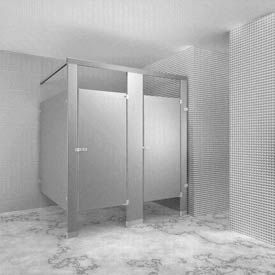 Pre-Configured Overhead-Braced Stainless Steel Bathroom Compartments Provide A Structurally Sound Configuration Created For Areas Where Strength Is Required. 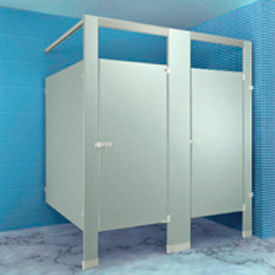 Stainless steel bathroom compartments create sturdy private bathroom stalls for public restrooms. Bathroom compartments are made using Type 304 stainless steel that is formed and cemented under pressure to a double faced honeycomb paper core. Features #4 satin finish. Doors and panels are 1" thick and include 1-1/4" thick pilasters for rigidity and support. Included hardware is made of chrome plated die-cast zamac. Doors include latch for privacy. Pilasters include a 3"H stainless steel trim shoe to cover bottom mountings. Head rails are made using brite anodized aluminum extrusion that is 1"W x 1-3/4"H. Pre-configured bathroom stall compartments include everything needed to build a 1 compartment, 2 compartment or ADA compartment bathroom stall. In-Corner stalls measure 36"W x 60"D each. ADA Compliant stalls measure 60"W x 61-1/4"D.
Overhead-Braced Stainless Steel Bathroom Partitions & Components Help Create Private Bathroom Stalls In Public Restrooms. Overhead-braced design provides a structurally sound configuration created for areas where strength is required. Partitions and components are made using Type 304 stainless steel that is formed and cemented under pressure to a double faced honeycomb paper core. Features #4 satin finish. Pilasters are 1-1/4" thick and help support doors and panels for rigidity and ease of installation. Pilasters include a 3"H stainless steel trim shoe to cover bottom mountings. Partition Panels are 1" thick and require Panel to Pilaster Bracket Kits for installation. ADA-compliant panel available. Doors are 1" thick and include a privacy latch. Doors also include hardware made of chrome plated die-cast zamac. 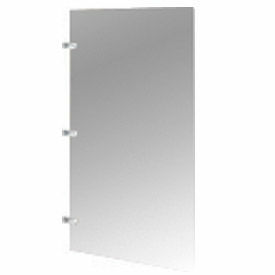 Head Rails are made using brite anodized aluminum extrusion that is 1"W x 1-3/4"H.
Stainless Steel Wall Mounted Urinal Screens Create Privacy Partitions For Urinals In Public Restrooms. 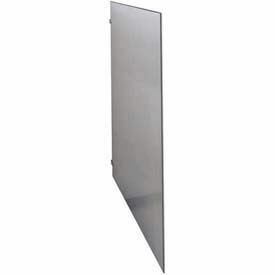 Stainless steel urinal screens provide privacy between urinals. These privacy partitions are 1" thick and made using Type 304 stainless steel that is formed and cemented under pressure to a double faced honeycomb paper core. Stainless steel has a #4 satin finish. Includes chrome plated zamac mounting brackets for wall mount installation. Measures 42"H.
ASI Global Partitions Stainless Steel Bathroom Partition Components Are Used For Schools, Offices, Public Buildings And More. Bathroom Partition Components are made of stainless steel and satin finish formed and bonded to a honeycomb core for long lasting durability. Face sheets are held permanently in place by an interlocking strip welded at each corner. Door corners are welded to each other and adjacent face sheets for additional strength. Available in several dimensions and colors.